Is this a suggestion or a complaint? Maybe it's a little of both. Recently, a few of us went into Alterac Valley battleground for a little PvP. We met a horde killing machine. They broke into groups and ran roughshod over the alliance. It became painfully clear, after they took a graveyard and refused to leave, they were honor farming. If you don't PvP, you may not know what "honor farming" is. It's a reason PvP is loathed by a lot of people. Above is one of the alliance graveyards in Alterac Valley. 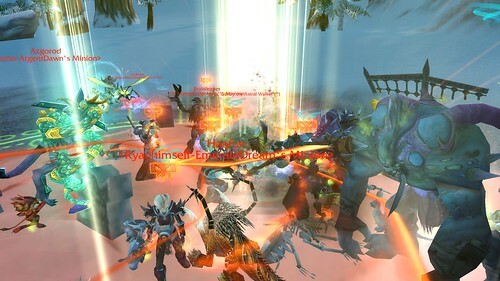 A group of horde has taken over the graveyard and, every time someone rezzes, they are immediately set upon and killed. Until someone actually clicks on the flag for the graveyard, horde will just stand there and kill anyone who tries to rez and run away. The problem is that resurrection in a battleground is controlled by the game. If you stand in or near the graveyard, even if you don't click on the "release" button, the game will release and resurrect you. You come back in the middle of 10 of the opposing faction and you stand no chance of running away or surviving. And every time someone of the opposing faction kills you, they get honor. The other faction is doing this on purpose and has very little intention of winning the battleground. They just want the easy honor kills. We were stuck. If you left the battleground before it was completed, you were stuck with a deserter buff. This means you can't go into another battleground for 15 minutes. If you rezzed, you were immediately killed. If you didn't rez but stayed near the graveyard, the game rezzed you and you were killed. If you ran away, you discovered there were no alliance controlled graveyards on the map because alliance couldn't get past the knots of horde. The few who did make it past were not enough to overcome guards or horde that lingered at the back to keep graveyards horde controlled. Eventually, alliance ran out of resources and horde won by default. This is beyond aggravating to me and, as I mentioned above, it's one of the reasons PvP has a negative image. This is no fun. I don't care to be honor farmed. I consider this an exploit. Minaithelan, Spectacular Death's PvP officer, points out that, once you die, you are worth zero honor for 20 seconds to the horde who killed you. That's not enough time. In graveyard camping, that horde can kill you over and over again, knowing he won't get honor for 20 seconds after killing you, but honor every other time. When you die repeatedly, he's going to get more honor even with a debuff. 20 seconds is a pittance of time. I would like to see negative honor for graveyard camping. If you or your team decide to camp a graveyard, honor is taken away. Let people rez, get health back, buff up and then go back into combat, knowing they have a fighting chance. The boundaries of the graveyard should be 20 feet beyond the visual fence, too, so you can't just stand at the sides and wait. I think honor should be removed at double what you would get for killing me. I think it should be team wide, too, so the pressure of the group is brought to bear on people who find graveyard camping in battlegrounds "fun". If this is too complicated to implement, then I'd like a "Get Out of PvP Free" ability. Once every 90 minutes, you have the ability to leave a battleground before it ends without the 15 minute debuff. My guild mates and I hung on in Alterac Valley, ultimately deciding to run away from the graveyards, out into the field where we couldn't be auto-rezzed. We wanted to continue to do battlegrounds without the deserter debuff because it's not our fault that we can't play as the event is designed. This is a classic case where an ability to get out would save sanity and make PvP more user friendly.